Do you keep putting more time and effort into your marketing activities only to see diminishing results? That’s the conundrum facing hundreds of retail marketing teams who have gotten caught up in the Email Death Spiral — but there is a way out. I recently asked retailers a simple question: Using the levers that you have today, how would you double the performance of your email marketing? In return, I got a paradoxical, yet very honest response: Send more email. What’s the problem with that answer? When you think about the reality of sending more email, you end up with an exhaustive stream of activities, and those activities leave you with less time to personalize. In turn, that lack of personalization breaks your marketing metrics, leaving you in a hurry to increase performance. But all you have left to achieve that goal is to send more email. And there we have the Email Death Spiral: The continuous, manual workstreams your team endures to send more and more email, all in an effort to maintain a high performing email marketing program. But when you get caught up in the Email Death Spiral, you end up regularly increasing your work to combat ever declining performance. How did we get here? The Email Death Spiral exists because email service providers (ESPs) are built on transactional infrastructure that’s focused on sending (and charging you to send!) ever-growing volumes of email. They were not built to support performance. They were built with the purpose of making high volume sends possible, full stop. Given this setup, the Email Death Spiral actually works in favor of ESPs. That’s because when the main lever marketing teams have to maintain email performance is to send more emails, ESPs make more money since their business model is based on send volume. In short, ESPs have been and always will be geared toward having you send more email, and their shift in messaging from a sends story to “data” story is far more marketing than a shift in approach. Just look at the new features your ESP released in the last year. Most likely, it’s a set of advancements to workflow features to help you control and monitor the continued decline in email performance. 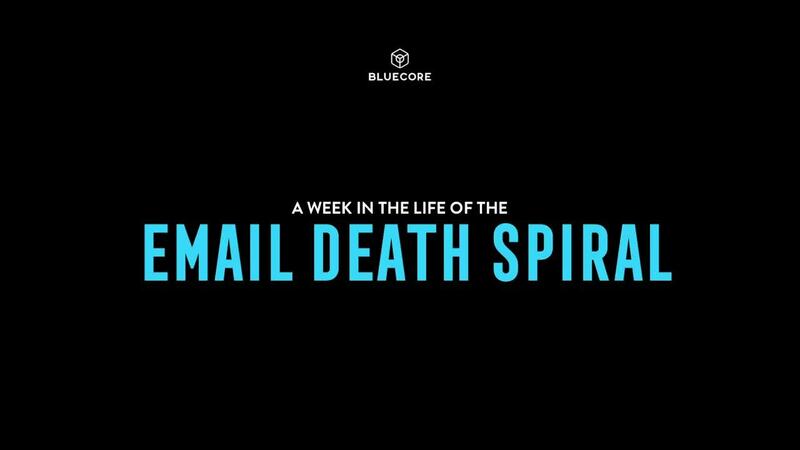 The Email Death Spiral is a harsh reality of today’s digital marketing world. But that doesn’t have to be the case. So what is the way forward? It’s now clear that increasing volume and using email hacks like segmentation and personalization widgets will only perpetuate the Email Death Spiral. To drive sustained revenue growth from email, you need a modern technology that prioritizes performance over volume. And you need a solution that helps you achieve those performance gains with less effort. Fortunately, achieving that ideal state is possible today with the right AI-driven technology. Technology that uses smart workflows to streamline the send and personalization process, giving your team more time to strategize and focus on higher level tasks. Critically, this technology should also help increase performance by using feedback loops to optimize emails over time based on how your customers engage and input your marketing team provides. As we prepare to climb out of the email death spiral once and for all, what does that future look like? Click here to watch as Bluecore CEO Fayez Mohamood shares a preview of the major advancements that will shape retail marketing over the next five years. Sherene Hilal is the VP of Product Marketing and Operations at Bluecore. In this role, Sherene leads the commercialization of products and business operations, with a focus on enterprise readiness. Previously, Sherene was the VP of Product Marketing at Curalate, a content intelligence platform that makes images shoppable. Prior to Curalate, she served as the Senior Director of Outbound Product Management for BlueKai (and later Oracle, following the company’s acquisition), where she defined and developed the “Data as a Service” category. Sherene holds a Master’s Degree in Applied Math and Systems from Columbia University and a B.S. in Applied Math from Cornell University. Why Is There All This Innovation In Email? We're experiencing a new wave of innovation in the email channel. Why are we seeing this innovation all of a sudden? And what does it look like? Retailers must continuously evolve their approach to personalized marketing. Here's why this iterative approach is so important and how to make it happen. How do you bridge the gap between what your marketing team can deliver & what your customers want? It's time to create a more balanced marketing experience.